Behavioural observation is the key to best practice youth work. A few weeks ago we stated that we would look at how to develop a behavioural lensto inform how you work with young people and colleagues. A lens that will help you understand peoples strengths and weaknesses, how to speak to them in a way that will help you develop your relationship with them and ultimately strengthen your work with everyone you come across. This week we show you the framework. A while ago I interviewed for a managementposition. One of my interviewers was someone that if I got the role I would supervise. In the interview I was able to answer the questions and got along well with two of the three interviewers. The third interviewer was a blank slate. I couldn’t read him at all. The worst part was that he was going to be my direct. I was freaking out and needed a way to break through their blank persona. A few years earlier I was managing a youth drug andalcohol rehab. I had a young person come to us straight from jail with a personality bigger than Ben Hur. Everyone thought he was great, the life of the party. He was a lot of fun to work with, but he was also really frustrating. He never followed through on anything!!! These are just two people and a snapshot of their behaviour, but I am sure you can all imagine people like this that you have come across. Before I was shown this simple but most important framework people showing these behaviours were extremely difficult for me to understand or work with. Afterwards, with a little work, I have become a better judge of character and supportive youth worker. DISC is a quadrant behavioral model based on the work of Dr. William Moulton Marston (1893–1947) to examine the behavior of individuals in their environment or within a specific situation (otherwise known as environment). It therefore focuses on the styles and preferences of such behaviour. For most, these types are seen in shades of grey rather than black or white, and within that, there is an interplay of behaviors, otherwise known as blends. The determination of such blends starts with the primary (or stronger) type, followed by the secondary (or lesser) type, although all contribute more than just purely the strength of that “signal”. Having understood the differences between these blends makes it possible to integrate individual team members with less troubleshooting. In a typical team, there are varying degrees of compatibility, not just toward tasks but interpersonal relationships as well. However, when they are identified, energy can be spent on refining the results. 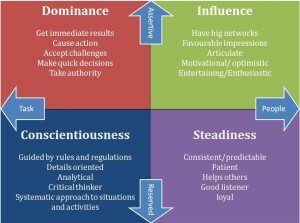 The four behavioural types are Dominance, Influence, Steadiness and Conscientiousness. Those with Dominance and Influence behavioural types are more ASSERTIVE. 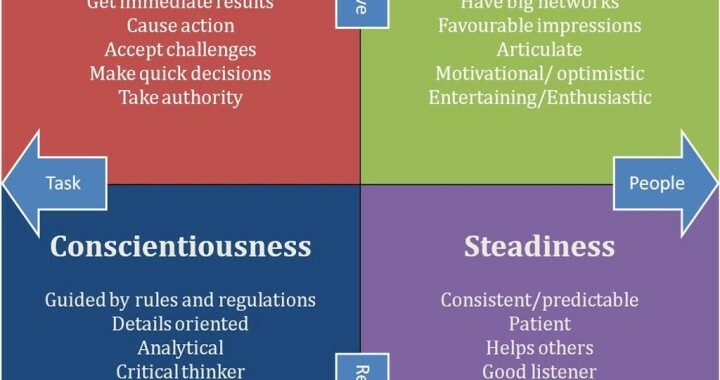 Those with Steadiness and Conscientiousness behavioural types are more RESERVED. Those with Influence and Steadiness behavioural types are more PEOPLE focused. Those with Dominance and Conscientiousness behavioural types are more TASK focused. This graphic illustrates this more effectively. Over the coming ‘Thursday Think Tanks’ we will delve more into these behavioural types and how they can help you to develop your emotional intelligence and practical wisdom. In the meantime Stay Frosty!!! Posted in Uncategorised and tagged accontability, DISC, Emotional Intelligence, Network, pillars of sucessful youth work, Practical Wisdom, professional development, self care, Supervision, Youth Ministry, Youth Work, Youth Worker. ← Youth work boundaries: fuzzy or fixed?? ?